Posted September 5, 2010 by Emmet Farrell in News. As children returned to Cregmore National School yesterday morning, anxious parents expressed fear for their safety in the wake of another crash at this location at the weekend. 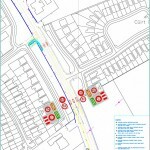 And an impassioned plea has been made to Galway County Council to carry out urgent safety works at the crossroads which is becoming a notorious accident blackspot. On Saturday afternoon, one adult and three children were taken by ambulance to hospital following another accident at Cregmore crossroads. Fortunately, there were no fatalities and all four will make a full recovery. But the accident has sent shudders down the backs of parents as they brought their children back to school yesterday morning after the summer break. destroying several cars. It was a scenario of potentially horrific proportions that happened as schoolchildren were being collected by their parents. “We have escaped the loss of life”. He was referring to the latest accident at the crossroads at which the school is located. “On Saturday I came upon the crash. To see three children in the back of a car that had been smashed up put my heart crossways. Unfortunately we have the reputation in Cregmore of being a rat run for people who want to avoid Claregalway. We have a very high traffic flow on roads that are not built for that. The school wall has been knocked again and right beside where the truck crashed into it earlier this year. There are more than 220 pupils in that school and they have returned to class yesterday. I am afraid of the traffic on that road and I am afraid of what might happen. I am begging Galway County Council to do something to protect the lives of our children. There have been two or three serious crashes at this location in the recent past and each time the school wall has been hit”, Mr. Higgins explained. Almost two years ago, Galway County Council knocked down a stone wall and hedging and put up a timber rail fence. Mr. Higgins believes that this served to open up the area to increased traffic and it also increased the speed in the area. “We had received an environmental award for the upkeep of the stone wall in the area and then the Council comes along and knocks it down. 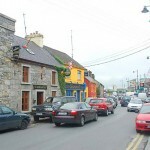 It was to facilitate traffic because the Claregalway bypass is not going ahead”, he added. 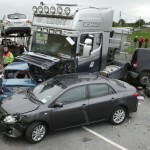 “The problem is the main road from the Monivea Road to the bridge where there is excessive speed. We fear that there are going to be fatalities at this junction. I am scared and genuinely scared and so are the parents in the whole community”, Mr. Higgins said.